We have a drafting table I had planned to use, but we haven't found all the parts yet, so this will have to do for now. I think the drafting table will allow for more storage underneath, as this folding table has leg hinges that limit the space underneath. At least I can sew again. I'm still missing some patterns, but I have electronic versions of them all in iBooks on my iPad. 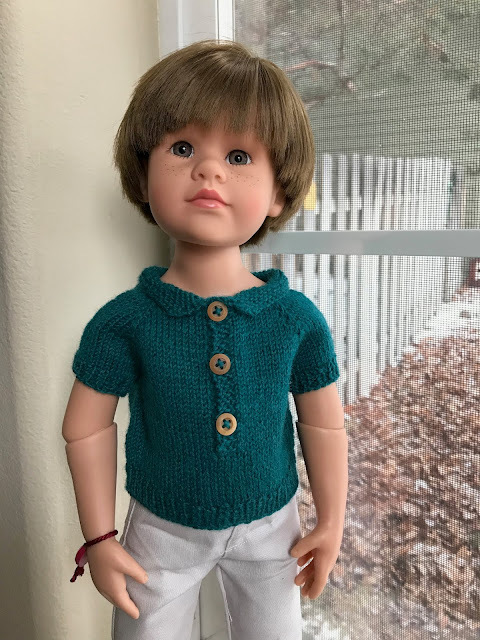 I'm just starting on a shirt and jeans for Billy. He did get a knitted shirt this week. It's based on the Everyday Play doll dress. The neck is a little different, starting with a collar, then increasing to the number of stitches the Everyday Play dress has to start. The sleeves are 4 rows/rounds longer, the placket is in front and then the body is worked straight down before ending with the ribbing. You may notice Billy's hair is a little different. 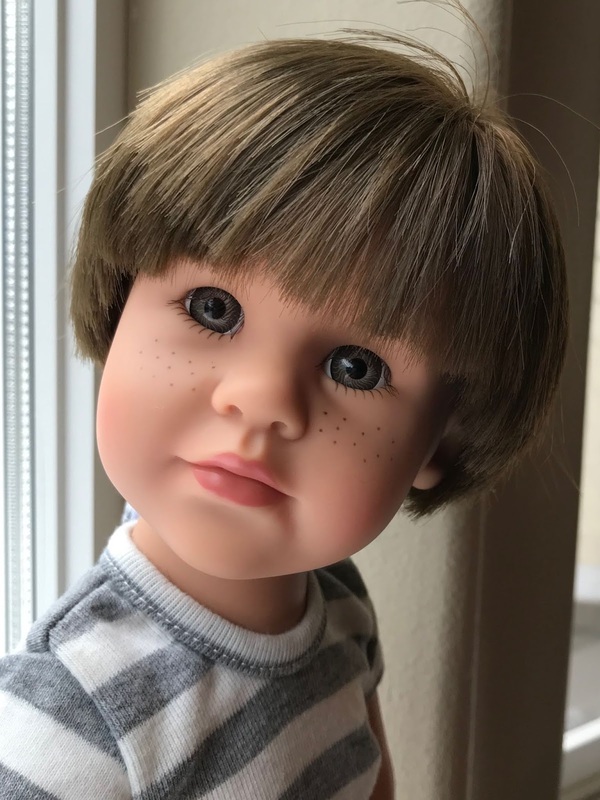 He has had hair in his eyes, so I decided to try to see if bangs/fringe would work for him. The hair in the back stuck out, too. The problem is that the roots are angled straight out from the scalp. 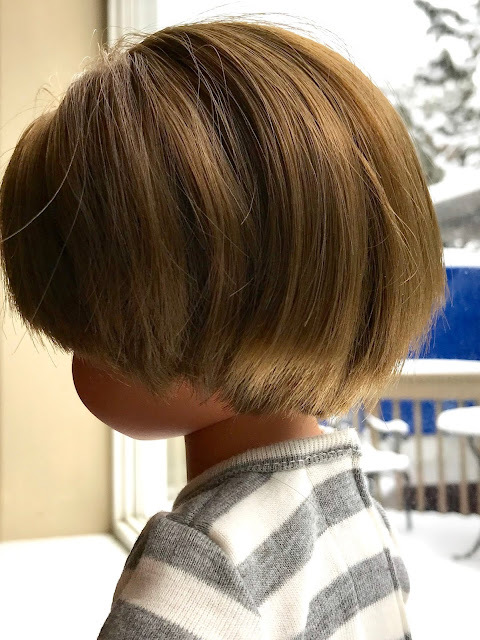 Before cutting anything more, I wet the front and the back, then put on his knitted cap, leaving it on until the hair was almost dry. Then I let it finish drying without the hat. This seemed to work, so I went to work with the scissors, first on the front and then, when that worked well, on the back. I trimmed the front to just above the eyes, then layered it a bit. Then I had a go with the back. I could probably cut off more in back, but I decided to leave it this way for now. I think Billy looks more like a boy than ever now. 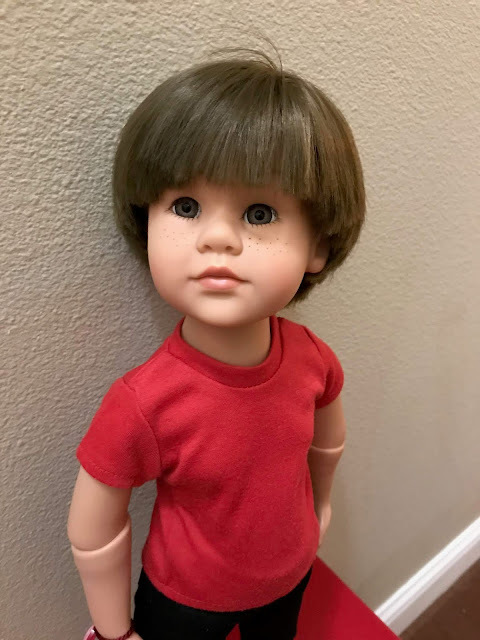 I had already done the photo shoot for one more story with Billy before his latest haircut, but other than that, he will look like this from now on. Friday's story shows Billy already with his new haircut. I moved the stories around because I needed to spread out the more serious topics and cover something fun, like the physics of why balls bounce and eggs don't. 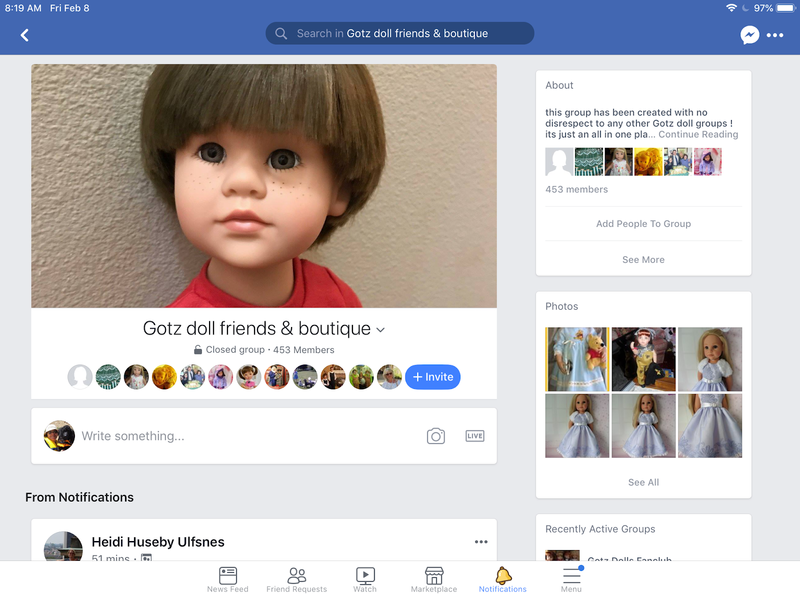 His photo was used for the Gotz dolls friends and boutique group's cover photo on Facebook on Friday. They change it every day, so they're always looking for nice pictures. The admin said she thought this face was better as a boy, and I agree, which was why I picked him to be my boy. Now he needs more clothes, so I plan to work on that this week. It snowed most of the day on Saturday. Eventually, we ended up with about 6" and a few more overnight, so I had to clear the snow off the car and scrape the windshield to go to church on Sunday. It was nothing like what I'm used to, though. It was funny to find out at church that a few people couldn't get there because of the snow. We were supposed to have a sermon by a guest preacher, but she couldn't get there. People were talking about events that were cancelled because of the snow. I found this funny, although I'm sure they know what they're doing. People in Bend are not used to even this much snow, so things almost grind to a halt. It was nice driving on roads that were almost empty. 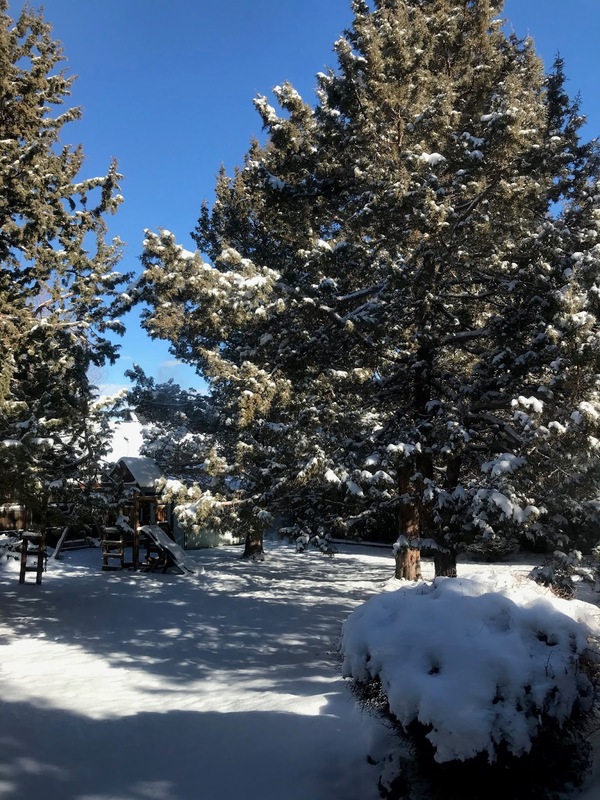 Here's what my backyard looked like by early afternoon on Sunday. It will melt pretty fast now. I had three medical appointments this week, getting caught up on things put off because of the move. The only other big thing I worked on this week was the Rose City Yarn Crawl's Mystery Knit Along. We get Clue #4 today and the final clue next Monday. 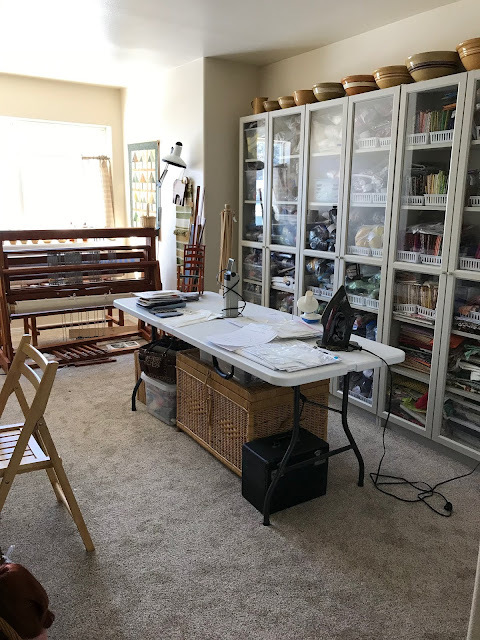 I'm not supposed to show photos of my progress on social media on the off chance someone who doesn't want to know what the final project will look like will see it. You will get to see it when it's allowed, however. What's on my needles: Finished the third clue in the Mystery Knit Along for The Rose City Yarn Crawl, which takes place in March. While waiting for the next clue (due today). Earlier in the week, I used the Everyday Play dress pattern as a jumping-off place for a shirt for Billy. The pattern, Everyday Play Shirt, is available for free from my Ravelry store. What's on my Sparrow 15: A shirt and jeans for Billy. What's in The Doll's Storybook: Bounce or Splat, Billy and Jolena have a short physics lesson. What's on my iPad/iPhone: Still The Cuckoo's Calling by Robert Galbraith, aka J. K. Rowling. Nothing like Harry Potter, but a very entertaining read. What's in my wine glass: Placer Andaluz Tempranillo-Syrah, no vintage. What's my tip of the week: Shelf-stable silken tofu, like Mori-Nu, is a good replacement for cream in creamed soups. Blend with some of the soup to add protein and reduce the fat. Yes, people here are always taken aback when we say we moved to Bend to get away from the awful winters in Park City. I'm working on some jeans for Billy, and the shirt is already cut out. My family had friends who moved from the northern part of the Upper Peninsula of Michigan to Joplin Missouri. The 1st winter they were there everyone was in a panic because the weather reported they might get up to 3 inches of snow. John & Dee sure got a good a laugh out of that. Of course people didn't believe them when they said they would get snow up to the upper story of their house in MI. Same when I moved from MI to Austin TX in 1977. 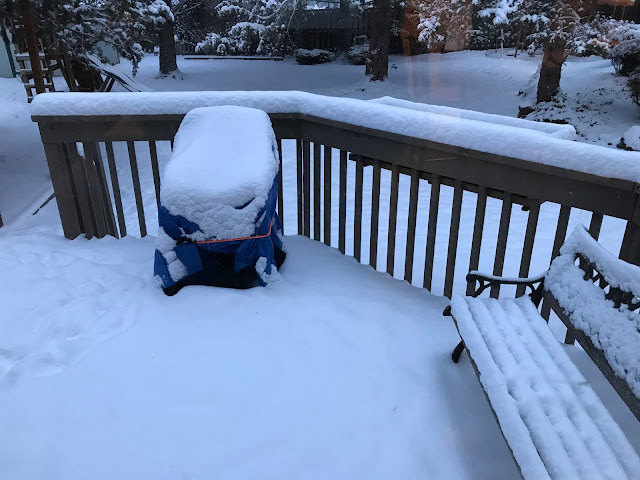 I even had one co-worker tell me that the pictures in the news showing all the snow had to have been staged as there just wasn't anyway in the world there could be that much snow fall. Of course people believe it is 100 degrees all year around in Las Vegas & Phoenix too. Billy looks very handsome with his new haircut & sweater. Thanks, Carol Ann! My kiddos needed longer hair because of their cowlicks. With his new haircut, I think Billy looks a lot like my real boy (now age 32) when he was in first grade! He had big brown eyes and his hair was the same color as Billy's. He even had the few strands that stuck up at the crown of his head which I was always trying to pat down! He always wore his hair a little longer than most kids because he inherited his great-grandmother's uh. . . shall we say "generously sized" ears! Great hair cutting job, Peggy.